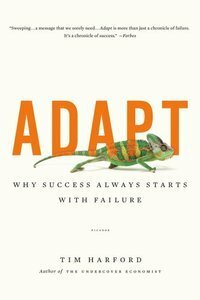 Tim Harford, "Adapt: Why Success Always Starts with Failure"
In this groundbreaking book, Tim Harford, the Undercover Economist, shows us a new and inspiring approach to solving the most pressing problems in our lives. When faced with complex situations, we have all become accustomed to looking to our leaders to set out a plan of action and blaze a path to success. Harford argues that today’s challenges simply cannot be tackled with ready-made solutions and expert opinion; the world has become far too unpredictable and profoundly complex. Instead, we must adapt.